The other day, one such boat from our marina started heading North again. They left quietly for their Virgin Island's destination...quietly, that is, until their EPIRB went off. 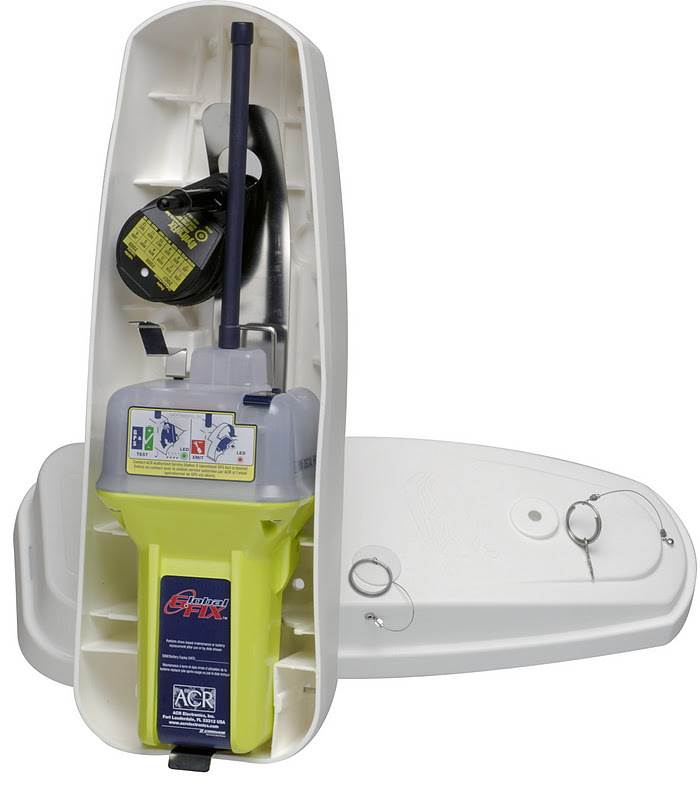 For those that don't know - an EPIRB is an emergency position-indicating radio beacon that some boats have on board as a safety device. Personally, I wouldn't venture offshore without one, but many do. When disaster strikes, it's your last ditch effort, your 911 call on the water, a final lifeline to the outside world when radio and all else fails you and, if you activate it, it is presumed you are in imminent danger or worse. Once activated (either manually or when submerged in water, as in a sinking) a signal with GPS position is sent out into the atmosphere. This signal can be picked up practically any distance from shore, anywhere on the globe. They are monitored world-wide and taken very, very seriously. Ships large and small within striking distance are alerted and are expected, by law, to divert and search for the vessel. The nearest Coast Guard operations are notified and rescue efforts put into effect. Families are called. Cruising communities alerted. In short, it's a big deal. EPRIBS have saved countless lives that would have otherwise been lost without a trace. When this particular boat's EPIRB went off, it took all of a few hours for the news to travel back to the Grenada cruising community. While many of us were certain it had to be a fluke or an accident (there had been no significant weather whatsoever) we all remained quietly mindful that there is always risk out there; collision with another ship, an unfortunate run-in with a rogue container or some other freak accident. The mind boggles. The fact is, if their lives were in danger, the word (complete with their last known GPS position) was widely known within a couple hours and people were out looking for them. Pretty impressive. As it turns out, the boat and it's crew are fine - but this is good reminder as to how effective an EPIRB is in case of emergency. It's also a good reminder that if you have an EPIRB on board, make sure to keep it in a place that is not only convenient and easy to deploy, but one that is inconspicuous enough so that you won't accidentally activate it. Not only accidental activation cause your fellow cruisers and family a good amount of worry, but you will potentially rack up a bill of god knows how much after all the resources are put in effect to find you. The cruising community here and up island collectively breathed a sigh of relief to know our boater friends were safe, and I for one am relieved to have seen first hand just how effective this fantastic safety device is. Beautiful equipment, but doesn't always work: just read form Yachting Monthly about the Fastnet capsize, that their Epirb did'nt work beacuse it was trapped inside the carbon hull after their kell had broken off.